.......53 Buddhas and Me .................My Life Adventures.....: "Happy Birthday To Me"
OK, for those of you who don't know today is my 56th birthday. I just LOVE birthdays - especially my own. My day started bright and early with water aerobics and some laps of the pool. It feels so good to do some sort of movement at the beginning of the day. 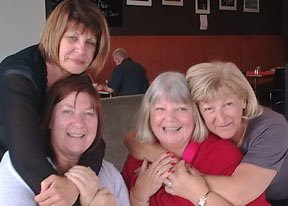 Then I went out to lunch with my daughter Rachel and 4 of my oldest friends (time not age). I have known Marjie since grade 3 and then we met Sheri & Jenny in our 1st year of high school. We have been best friends ever since. Is so nice sharing so much history with girlfriends that make me feel so comfortable. Friendship - that's REAL friendship - is probably the most important thing we can have in our lives. It keeps us happy, sane, comforted and loved. To all of my REAL friends out there - you know who you are - thank you for being my friend and I love you. I also have to say that in my life I have the best daughter anyone could ever have. She is caring, fun and loves me - what else could a mother ask for. Oh- just in case my son Shane reads this blog - he is also pretty cool and I love him too!! "I wish I was a glow worm as a glow worms never glum. Cause how can you be grumpy when the sun shines out your bum"